Nidderdale has a long Christian heritage. During monastic times much of the area was owned or controlled by either Fountains or Byland Abbeys. Bewerley Grange Chapel, built on the site of an earlier chapel by Marmaduke Huby, Abbot of Fountains, has remained intact. This monastic link was restored and re-opened for worship in 1965. Thomas Lee. On July 24th 1766 John Wesley made his first visit to the dale, writing in his journal that “at Pateley Bridge such a congregation he had not seen since leaving Newcastle”. Today there are 9 Methodist churches: Lofthouse (at the head of the dale), Wath (just below Gouthwaite Reservoir), Pateley Bridge, Glasshouses, Wilsill, Fellbeck, Summerbridge, Darley and at the lower end of the dale, Shaw Mills. Each offers a warm welcome to visitors. Providence Church, Dacre, opened on 25th September 1827 as a Congregational Church and joined the new United Reformed Church (URC) in 1972. After 1984, Providence URC welcomed former members of Salem URC when it closed. 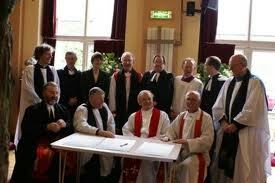 It is now the only United Reformed Church in Nidderdale. Today the people of Providence continue to meet for Christian worship and service in a community undergoing great social and economic changes. You can be sure of a friendly, warm welcome when you join us for Sunday worship at 9.00am. Providence is to be found in Dacre Top village on the B6451 between Summerbridge and Menwith. The 19th century saw a revival of the Church of England, with many new churches being built, either on new sites or as replacements for older buildings. These churches are usually open during daylight hours. The Dale is now served by five Anglican benefices, Upper Nidderdale (6 churches), Dacre with Hartwith and Darley with Thornthwaite, Birstwith, Ripley and Burnt Yates, and Markington with Bishop Thornton and South Stainley. The Roman Catholic church has had a faithful following through the ages. At the time of the reformation most of the leading families in the Dale were Roman Catholic, which helped to keep the faith alive in those troubled times. The building of the Catholic Church of Our Lady Immaculate, overlooking Pateley Bridge, came about with the provision of Mass for those working on the Nidderdale reservoirs. A priest would come by train from Leeds or Harrogate to Scar village. In 1923 a priest took up residence in Pateley and built this little church in 1935. The church still serves Catholics who live in Upper Nidderdale and the many visitors to this delightful place. 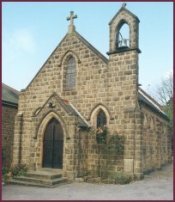 There is a resident priest for daily Mass, Saturday Vigil Mass at 6.30 pm and Sunday morning Mass at 11.00 am The lower dale is served by St. Joseph’s, Bishop Thornton. 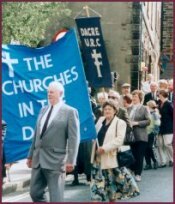 With a rich history behind us the Churches in the Dale now work together wherever possible. Childrens’ work A Methodist-led initiative to appoint a Children’s Worker has over the past three years developed into ecumenical project and it is planned to extend this work into the youth field for the year 2000. The churches also share facilities for producing magazines and other printed materials. The Churches in the Dale wish you a happy and refreshing stay in Nidderdale. We hope you will visit the sites of our Christian heritage and join us as we move forward together. Perhaps you will come across one of our processions or outdoor services when we proclaim our faith as the Christian family, visit our stand at the Nidderdale Show or join us for worship. You are assured of a warm welcome. Visit The Church in the Dale website.